This is an uncommon example of the 1828 view of Dublin, Ireland, drawn by Geo Petrie. 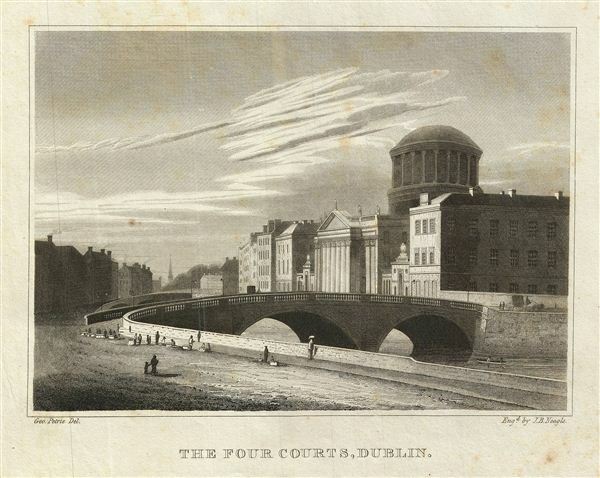 It features the Four Courts (Irelands main court buildings) where the Supreme Court, High Court, the Dublin Circuit Court and the Central Criminal Court. The Dublin Bridge (now known as the Father Mathew Bridge) can also be seen in the foreground. This view was engraved by J. B. Neagle as part of Malte-Brun's System of Geography, Vol. I., published in New York by Samuel Walker.